i don’t know about y’all, but i’m a snacker. i know there are people who only eat 3 times a day – breakfast, lunch, + dinner – but i am NOT one of those people. in addition to those three meals, i usually have a morning snack, an afternoon snack, + sometimes, a late-night snack. while it’s easy to reach for junk food (+ yes, occasionally i do), i feel better + more energized when i eat snacks with some healthy attributes – high protein, high fiber, heart-healthy fats, etc. on a cutting board, mince + mash the garlic to a paste with the salt. in a food processor purée the chickpeas with the garlic paste, tahini, lemon juice, olive oil, + 1/2 cup water, scraping down the sides, until the hummus is smooth. add salt to taste. add water, if necessary, to thin the hummus to the desired consistency + transfer the hummus to a bowl. the hummus may be made 3 days in advance + kept covered + chilled. when ready to serve, divide the hummus between shallow serving dishes. 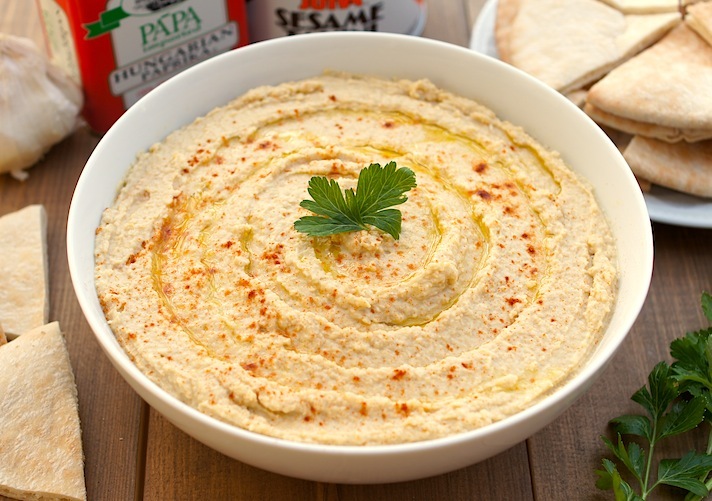 drizzle the hummus with extra olive oil, sprinkle with paprika, + serve with toasted pita. 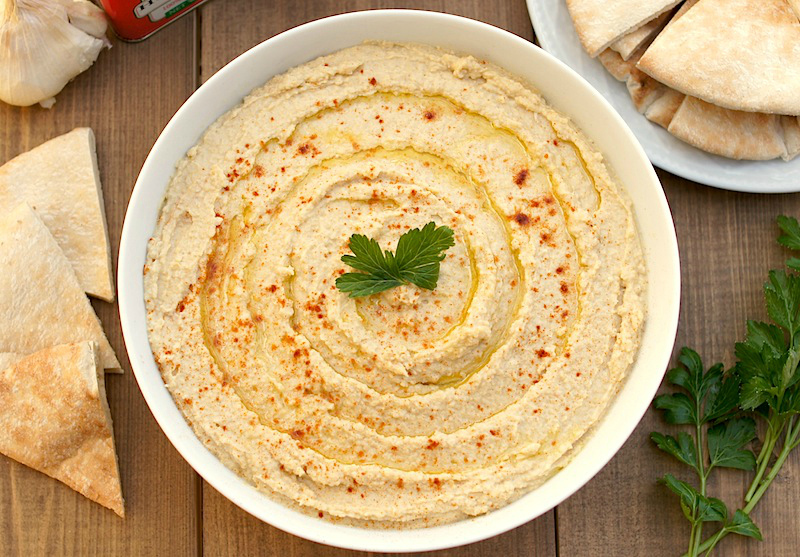 Hummus is so simple and yet delicious, I love the colors and freshness of your homemade version. Nice photographs! Yum!! I LOVE hummus. It’s a staple in my home as well. I love that I can get it at any convenience store, restaurant or grocery store (I live in the middle east), and it’s super delicious. It’s such a unique thing – each time I’ve had it they add something different. I love the variety! ooh, I bet you have access to some really wonderful + unique hummus over in Kuwait – too cool! It was so good to see you and a good hummus recipe is always welcome anywhere. I could eat hummus… and only hummus… for the rest of my life and be a happy camper. I get never get enough of it! And I love to make all kidns of it at home. I always looooove finding a new good homemade recipe. We’re the same! I can relate! I’m a constant snacker! And yes, sometimes (well, ok, a lot of times) I reach for junk food! But you are right! Hummus is a great snack / side that won’t leave you wanting for any other junk! Healthy snacking is the way to go! Beautiful hummus, Amy. A work of art indeed! Amy, this looks great! We make hummus wraps and pack them for lunch all the time. Always looking to try new hummus recipes! I love hummus but I’ve never made my own. It sounds so easy to do so I think it’s high time. This sounds fantastic and I’ll be making it soon for sure! Going to have to try this. I want to like hummus. But out of the few I’ve tried (store bought versions) I wasn’t impressed. My teenagers love it, so I’d like to try a,homemade version.